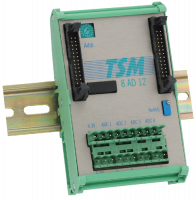 TSM-8AD12 is a general purpose analog input module that multiplexes eight input channels to a fast (6µs) ADC. 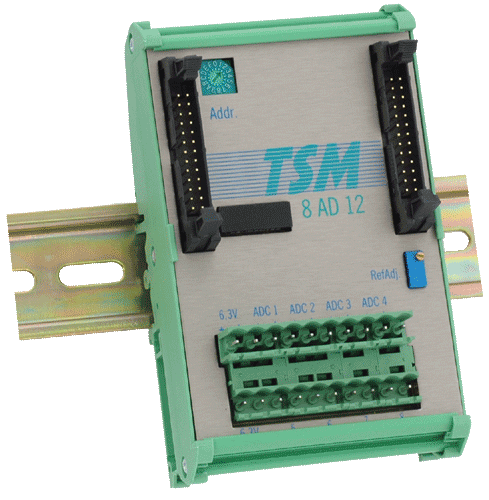 The software programmable input gives optimum resolution for standard signal levels. Low offset input op-amps maintain accuracy even with the high impedance signals often found in the field. The analog inputs are not isolated from the TSM voltage, thus, all inputs must be on the same ground level. If this cannot be achieved, external isolators (often combined with signal conditioning circuits) have to be used. If 4/20mA two wire sensors are used, supply them with 24V from the TSM power supply and connect the other wire to the signal input. Connect ground to power supply ground. The module has two rows of 10 pin screw terminal connectors for 4 channels each, with ground and signal inputs for each channel and 6.3V to supply signal conditioning circuits. Reading of an analog input requires selection of the input channel. After this, the result is available within 6µs, a status bit can be polled to test for ready. System software function calls are available to handle this.